Motivated team members are valuable. The overall productiveness and morale of your team increases as motivation rises. But how do you ensure that each team member is consistently motivated and performing at their peak? Inspiring your employees to perform their best requires a different approach for each team member. As a team leader, it is important to know how to identify what motivates each team member and how much motivation they need. The key is to find creative and proven ways to keep employees interested. 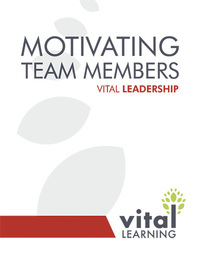 The Vital Learning Motivating Team Members™ course teaches managers and team leaders what motivation is and how it helps inspire team members do their best. It provides insight into how motivation is different for each team member and helps managers and team leaders understand how to create a work environment that will motivate team members. 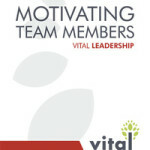 Click on the “e” to immediately enroll and begin the Motivating Team Members online course.